I can remember the moment I wanted to have an adventure like this. I was in Uganda for the second time visiting a friend and helping out at Krochet Kids International, a non- profit friends of mine from college had started. I was there for 3 weeks and met a group of American guys who were living and working at different organizations there. Since they were there for a while they had dirt bikes to take advantage of the beautiful land surrounding them. Nothing sounded better than getting on a dirt bike and riding for a day. I found one to rent and we hit the road. We rode all along these narrow, winding, red dirt roads passing small villages in the bush with kids waiving as we passed. We came back covered in red dirt and exhausted but that didn’t matter. We had an adventure and I was hooked. 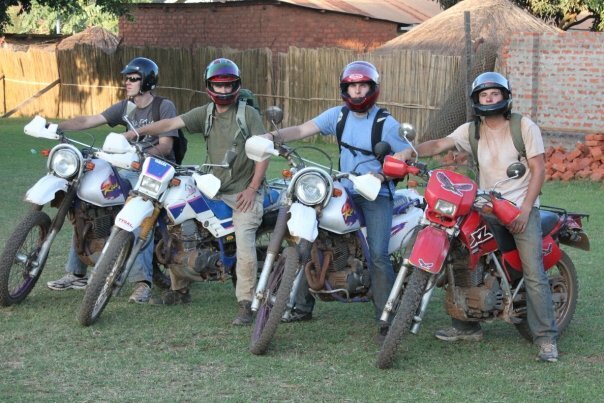 After a day of riding with new friends in Uganda. After that trip to Uganda I started dreaming about a long journey on a motorcycle. I had seen the motorcycle adventure documentaries Long Way Round and Long Way Down so my first thought was I should ride from Capetown to Cairo. I spent two years saving money to buy a motorcycle and in December 2011 I bought my first bike, a 2007 BMW G650X Challenge in almost new condition with only 1,300 miles. I now had a motorcycle to ride but no one to ride with and still no plan of where to go. I researched costs and realized how expensive it would be to ship my bike to South Africa. That’s when I had that a-ha moment. There’s a whole content just south of me that I’ve hardly been to. I googled South America motorcycle trip and found a blog by a young couple from San Francisco who rode all the way to Argentina. That’s it! I’ll just ride my motorcycle to Argentina. 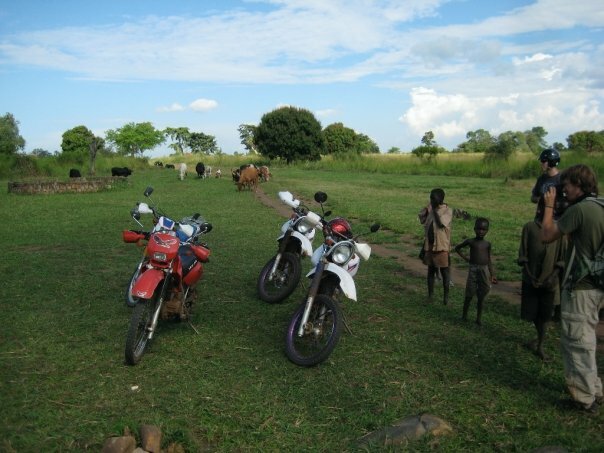 Since my ride in Uganda I brought up the idea of a long motorcycle trip with friends and while most of them wanted to do it they had other priorities like wives and kids. So my dream was on hold until I could find a friend to go on the trip with me. One year passed, and another, and then another, till one day I came across a blog about a guy who rode from Argentina to California by himself. A lightbulb went off. He was going to do the trip with friends by they backed out last minute and so he did it by himself. I found his email and shared with him my dream but that I couldn’t find anyone to ride with and asked what it was like to go by himself. He wrote back and replied that deciding to do the trip by himself was the best decision, and oh yea, that 6 months wasn’t enough time. After that conversation I had the realization that I could do this trip solo. That was August 2012. I started reading blogs and researching what it would take. I found the websites Horizons Unlimited and Adventure Rider. These sites had a wealth of information on traveling by motorcycle. I saw that there was a Horizons Unlimited event just a few hours from where I lived and decided I should go. I spent a weekend camping on the California coast with over 200 motorcycle travelers. Each day there were workshops and sessions on how to plan a trip, roadside repairs, budgeting, etc. There were riders from dozens of countries and of every age and background. There were 70 year olds riding two up through South America. If grandpa and grandma are making this happen than surely I can. I didn’t want to wait for retirement to hopefully have this adventure. It’s not guaranteed I’ll be alive that long. The time was now. So 12 months later, I’m heading off on a 15,000 mile adventure from California to Tierra del Fuego. So excited for you and admire you for following through with your dream. May you be blessed beyond words on your journey. We will be following you and praying for you daily. Thanks, Serena. I hope I can see the Biggs family before I leave. So rad Dan!! This is going to be an unbelievable adventure for you, good for you for making this happen and cheers to inspiring others to take more adventures like this! Kevin, I thought about packing a penny board to skate when I’m in cities. You will be in my thoughts and prayers as you undertake your adventure. All the best to you. Hey Dan, if only I had enough vacations days left this year, I wanted to ride my bike out to California and ride with you to the Mexican boarder. Well, I suppose, …next time! :-) “Rubber Down, Metal Up!” Be Safe!